Pityriasis rosea typically begins with a large, slightly raised, scaly patch called the herald patch. Pityriasis rosea is a common skin condition characterized by a scaly rash that sweeps outward like the branches of a pine tree. Pityriasis rosea is a rash that usually begins as a large circular or oval spot on your chest, abdomen or back. Called a herald patch, this spot can be up to 4 inches (10 centimeters) across. The herald patch is typically followed by smaller spots that sweep out from the middle of your body in a shape that resembles drooping pine-tree branches. Pityriasis (pit-ih-RIE-uh-sis) rosea can affect any age group. It most commonly occurs between the ages of 10 and 35. It usually goes away on its own within 10 weeks. 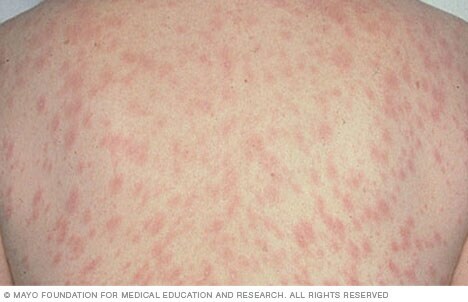 Pityriasis rosea can cause itching. Treatment may help relieve the symptoms. Pityriasis rosea typically begins with a large, slightly raised, scaly patch — called the herald patch — on your back, chest or abdomen. Before the herald patch appears, some people experience headache, fatigue, fever or sore throat. A few days to a few weeks after the herald patch appears, you may notice smaller scaly spots across your back, chest or abdomen that resemble a pine-tree pattern. The rash can cause itching, which is occasionally severe. See your doctor if you develop a persistent rash. The exact cause of pityriasis rosea is unclear. Some evidence indicates the rash may be triggered by a viral infection, particularly by certain strains of the herpes virus. But it's not related to the herpes virus that causes cold sores. 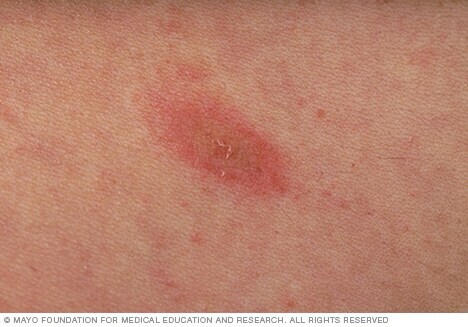 Pityriasis rosea isn't believed to be contagious.